Explore the gallery of photos against DRM in Web standards, and add your own! Last week, we asked you to show the World Wide Web Consortium (W3C) that you wouldn't allow Digital Restrictions Management in the Web's technical standards, and you answered. From around the world, you sent in protest selfies against the proposed restriction standards championed by Netflix, Apple, Microsoft, Google, and Hollywood. With you at our backs, we're organizing a major demonstration this Sunday, outside the building where the W3C will be meeting to discuss DRM. A parallel demonstration is planned outside the W3C office in Amsterdam. Our activism is working -- the campaign has drawn renewed attention to this once low-profile issue and more people are learning that DRM standards would be a major regression for user freedom on the Web. 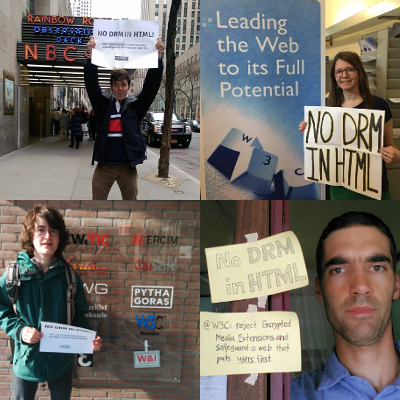 Add your protest selfie to the gallery: Pose with a sign protesting DRM in Web standards in front of a local landmark or skyline. This will make it clear that just as the Web is global, objection to DRM in its standards is global as well. The best landmark? One of the 20 W3C offices, scattered across the world (addresses for USA's and Japan's and all others). Try our printable sign if you're not feeling creative. Don't hesitate to invite friends for your photo. Even if they aren't already up to speed on the details of this campaign, they use the Web and DRM affects them too. Send your photos to info@defectivebydesign.org, along with the location where you took them. Photos sent to us will be shared under a Creative Commons Attribution 4.0 International license, so please provide the attribution you would like listed, or if you would like to remain anonymous, please state that you wish for no attribution. We'll publish as many of the photos as we can by Sunday. Organize a demonstration: There's a clear way to take this to the next level -- if you live near one of the W3C offices, organize a demonstration there! We'll help bring people by emailing fellow activists near you, and you can print our graphics and flyers. A demonstration on Sunday, 3/20 will be the most impactful, even if it is only a few brave souls. The details are up to you, but we recommend picketing outside with signs and then attempting to peacefully deliver a printed copy of our position letter against DRM in Web standards to the office. Let us know at campaigns@fsf.org if you can lead a demonstration. Over the weekend, Joi Ito, a prominent Internet freedom advocate, came out against DRM in Web standards. We have other important allies, including the Electronic Frontier Foundation, many member organizations and staffers at the W3C, and the 26 signers of our joint letter (read it for more detailed arguments against DRM in standards). The W3C's leadership and the proponents of DRM standards are watching closely, concerned about the amount of attention we are drawing to this. We've met privately with W3C leadership over this issue before, and now our allies are working with the W3C to arrange a public meeting in Cambridge on Sunday. Some of the W3C staff have blogged about our campaign. Everyone is waiting with anticipation for our demonstrations against DRM standards this Sunday, at W3C offices in the US and in Amsterdam. If we can keep the W3C from agreeing to DRM in Web standards, people will look back on this as a historic victory for the free Web. Let's do it, together!